Dunton was developed and named in the eighties (MLD notes that this refers to the 1880s) by the late Frederick W. Dunton, a nephew of Austin Corbin, president of the Long Island Railroad. Mr. Dunton was the president of the "Bicycle Railroad" and became interested in the development of real estate on Long Island in 1883. He built good houses and sold them to desirable citizens on easy payments. The village of Dunton was made up of small farms prior to this time. Mr. George Maure, after whom Maure Avenue, now 130th Street, was named, was actively connected with the progressive enterprises of Queens County. He was commissioned by a New York syndicate to purchase large tracts of land on Long Island, and later became associated with Mr. Dunton. Together they invested a large amount of money in real estate in this section and laid out several towns, of which Dunton was one. The early maps of the community indicate that Dunton proper extended from Atlantic Avenue to Jerome Avenue, or Broadway, as it was called in those days, and from Van Wyck Boulevard to 126th Street. The section between Jerome Avenue and Liberty Avenue, then called Centerville Avenue, was Dunton Park. If the library had been in existence at that time in its present location it would have been in a section called Liberty Hills. The Dunton Civic League was formed in St. Marys Episcopal Church, Van Wyck Boulevard in 1922 and has since been active in promoting projects for the betterment of Dunton, in fulfillment of its motto, "Community Betterment." Mr. Joseph A. Coyle is now president of the League. In the past the League was successful in campaigning for many projects, of which some of the outstanding were the Dunton Station of the Long Island Railroad, the $70,000 fire house, schools, and playgrounds. In one campaign for a new school to replace P.S. 55, located at 130th Street and 97th Avenue, which was called "Duntons Version of the Little Red Schoolhouse," the following adjectives were used: "Antiquated, inadequate, 40 year-old, unsanitary, out-of-date, unsafe, and over-crowded." The adjectives must have served their purpose, for a large, new, modern school building was built at 97th Avenue and 131st Street, and at the beginning of the term February 1939, was ready for occupancy. It is reported that the League is now campaigning for a subway along Van Wyck Boulevard from the Van Wyck Station on the Eighth Avenue Subway to Rockaway Boulevard, a new Dunton Library, and a Dunton post office. The Dunton Library had its beginning April 26, 1917, in a small space in Thorntons drug store at 31 Jerome Avenue, as a community station in the Traveling Division of the Queens Borough Public Library. Two classroom cases were used for childrens books. The adult books were in small collection cases in the window, and were restocked from a station box kept in the back room. In June 1918, Mr. Thornton rearranged his store to the advantage of the library, by making room for three large cases farther back in the store. The library moved to a small store building at 104-12 130th Street in 1928. In January 1934, it moved into much larger quarters at its present location, 129-20 Liberty Avenue, a building formerly occupied by a branch of the Bank of Manhattan Company. The building is still owned by the bank. The community of Dunton is made up mostly of German, Irish, and Italian extraction. There are a large number of Jewish families in the neighborhood; the Dunton Jewish Community Center is one and one-half blocks from the library. Most of the people are of the business class and many own their own homes. Most of the homes are one-family houses, but there are a few two-family houses, and small apartment buildings. Some of the storekeepers live over or in the back rooms behind their stores. There are enough renters to make it seem as though Dunton has a quite transient population, if the numerous changes of address recorded at the library is any evidence of fact. In 1884 Frederick W. Dunton, the nephew of the first president of the Long Island Railroad, was traveling East and he admired from his railroad car window the green and rolling hills of what is now Hollis and Holliswood. He purchased 136 acres of farmland and divided it into lots for sale. He laid out the curving streets of Holliswood and gave them Latin or Spanish names, such as Rio, Como, Marengo, etc. Epsom Course, oval shaped, was built by Mr. Dunton as a trotting race course. Many famous trotters were seen on its turf. For himself he reserved a big lot at the southern edge of Holliswood on Dunton Avenue and built a big and beautiful mansion called Hollis Hall with views all the way to the ocean. After Mr. Dunton’s death, Hollis Hall was sold and became a restaurant named Brown’s Chop House. It was reported to have been a speakeasy during prohibition. When prohibition ended, Brown’s Chop House was torn down. The hill on which it stood was leveled, and our garden apartment complex was erected on the site in 1949. Frederick W. Dunton (1851-1931): Born in Newton, New Hampshire, Dunton was blessed with his mother’s being a sister to Austin Corbin, president of the Long Island Railroad. Frederick Dunton went on to found Hollis (1884) and then Dunton (now Morris Park), southeast of Richmond Hill. His residence, called Holliswood Hall, had a fine view of the Atlantic Ocean! Among Dunton’s accomplishments was his help in founding the Bank of Jamaica, his election (1869) and re-election (1896) to the Board of Supervisors of Queens County, and his being supervisor of the Town of Jamaica. He is interned at Maple Grove Cemetery. Opened in 1875, Maple Grove Cemetery is a beautiful, 65-acre burial ground in Kew Gardens, with its main entrance on Kew Gardens Road and Lefferts Boulevard. It was modeled, in part, after the Greenwood Cemetery in Brooklyn, a 478-acre tract, also well above (478 feet) sea level, and established in 1838 as a rural cemetery and horticultural garden, Maple Grove, like Greenwood, is an oasis in an urban environment. Bordered on the west by the Park Vendome, Park Chateau and Imperial, undistinguished apartment buildings built by the Lefraks, in the north by noisy Queens Boulevard (Hoffman Boulevard), the widest (over 250 feet in parts of Forest Hills) street in New York City. Bordered on the east side by the Van Wyck Expressway, a Robert Moses highway overcrowded in its first week of use, our verdant section is not only a fine spot for contemplation but also contains the remains of some distinguished individuals who left a mark on Central Queens culture. 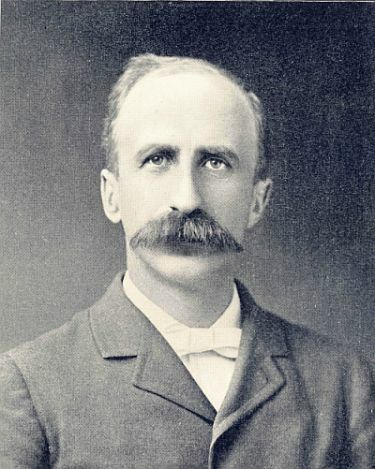 Fredrick W. Dunton, circa 1896 - Photo submitted by Carl Ballenas, Richmond Hill Historian. For more information about the Long Island Railroad, click here. If you have additional information to submit, please email us at: .